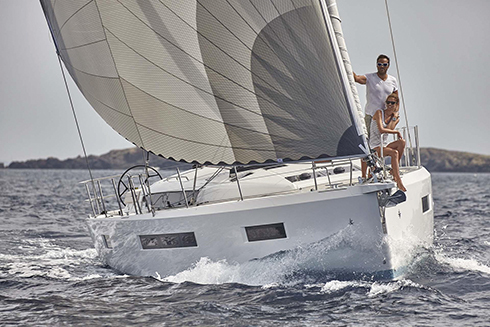 The brand new Jeanneau Sun Odyssey 490 was introduced at the Miami International Boat show in February to rave reviews. 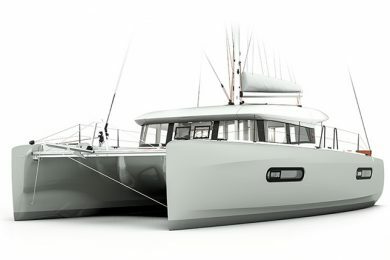 The 490 is the big sister to the 440 that was launched at the Annapolis show last October and carries a close family resemblance. 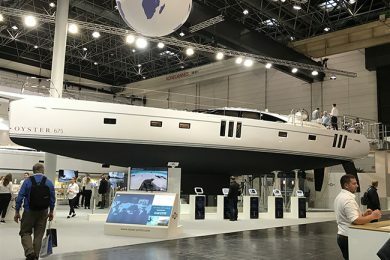 As Jeanneau America’s president Nick Harvey noted at the Annapolis launch, these two designs mark the beginning of the next generation of Sun Odysseys and both incorporate innovations that make sailing, cruising and living aboard easier and more comfortable. 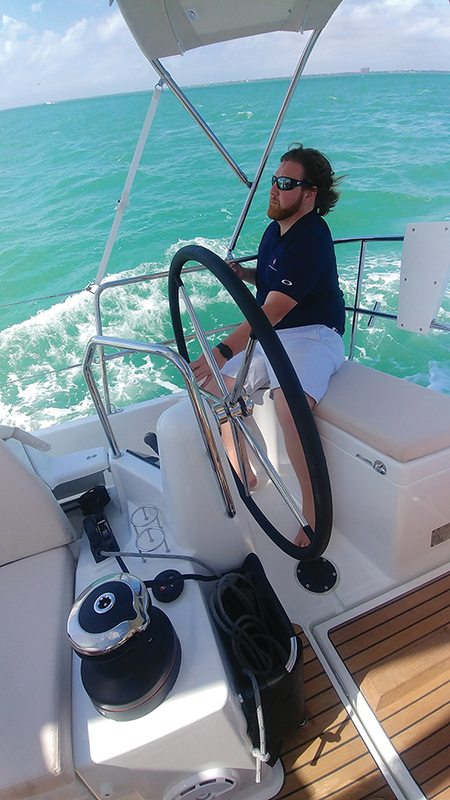 We joined the new 490 at the Key Biscayne Yacht Club and headed straight out on to Biscayne Bay with the easterly trade wind blowing at 10 knots or so. It was a perfect Miami day for sailing on the bay. 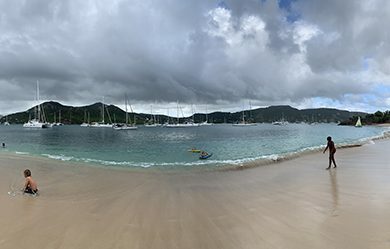 Once we got the mainsail rolled out and the 125-percent genoa set for a broad reach, the 490 accelerated and soon we were sailing at over seven knots. 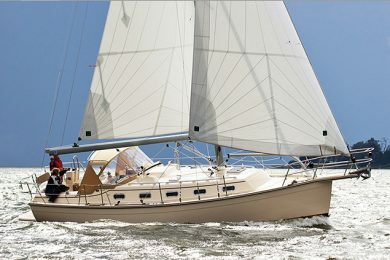 I had sailed the new 440 in Annapolis after the boat show so I knew that these new Philippe Briand designs were really solid performers under sail. The 490 didn’t disappoint us. 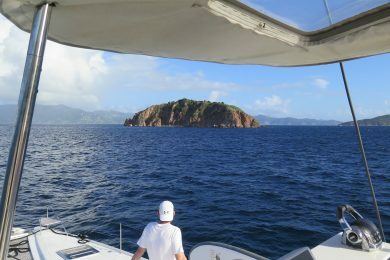 In the good breeze and flat water of the bay, we tacked easily through 85 degrees and were able to maintain seven plus knots hard on the wind. 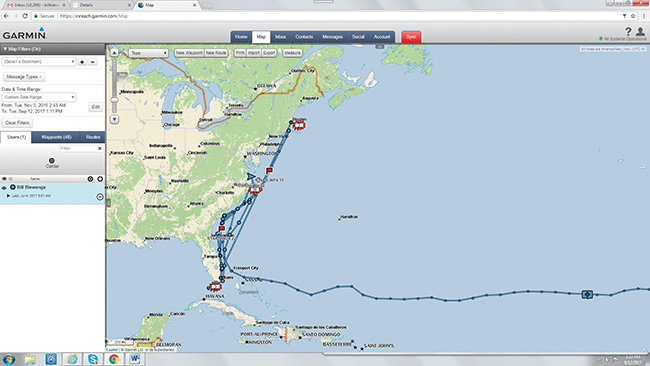 As we eased sheets and powered up, the GPS showed speeds of over eight knots several times. The 490 has twin wheels and twin rudders so the steering is light and positive; it’s like driving a sports car. The hull has full-length chines that kick in when the boat heels to about 15 degrees. This is not a cosmetic chine but a real design feature that improves performance while also adding to interior volume for the living space. As we put the 490 through its paces, we were confident that this is one of the better performing Sun Odysseys we’ve ever sailed, and we’ve sailed a lot of them. 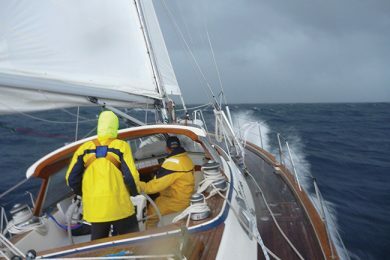 The ergonomics of the cockpit work very well with the halyards and control lines for the roller furling sails and the vang leading through line stoppers to winches on the coach roof next to the companionway. All sheets lead aft along the side deck and through conduits to line stoppers and self-tailing electric winches (optional) at both helms. The main sheet is doubled-ended so you can trim the sail from both sides of the boat. The sheet winches are mounted on pods that allow you to crank a winch handle while standing comfortably over the winch…that is, if you don’t have electric winches. In my book, in a boat of this size and if you are much past 50 years old, electric winches make a lot of sense. The electronics—MFD and sailing instruments—on the boat we sailed were mounted on flat surfaces on both pods so they were easy to read and adjust from the helms. The autopilot control head was mounted at the aft end of the cockpit table module with the light switch control panel. The engine instrument panel was mounted in a recessed area in the side of the cockpit module where it was easy to see from the starboard helm. The throttle gearshift was handy to the starboard helm. The 490’s cockpit has the unique “walk around” design first introduced in the 440 last fall. Instead of climbing over the cockpit coaming to get to the side decks and go forward, you simply walk around behind the helms where the side decks have been sloped aft to meet the cockpit floor. As we have said before, when you first see and experience the walk around design you wonder out loud why no one thought of this before? It’s perfect. The aft end of the cockpit has a folding transom that lowers mechanically to be a wide and useful swim and boarding platform. The turnbuckles for the split backstay attach to chainplates that are mounted on heavily reinforced corners of the aft cockpit seats. This is a very strong system and better than mounting chainplates on the flat sections of the stern. 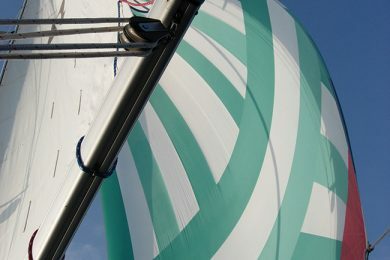 Going forward from the cockpit, you’ll notice that the lower sidestay chainplates are mounted inboard on the cabin side while the cap shrouds attach to chainplates outboard on the gunnel. 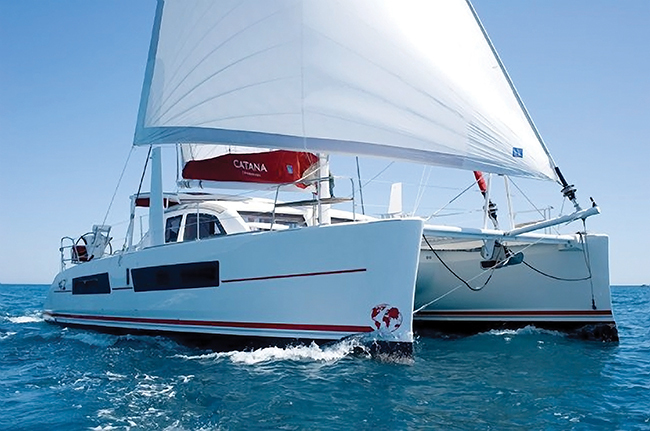 This allows a person to walk forward without ducking under the lower stay and opens up a clear sheeting path for the standard 125-percent roller furling genoa. 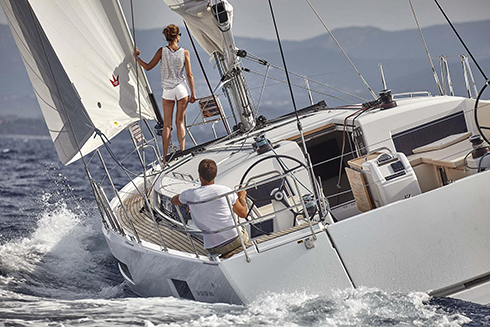 A self-tacking headsail with its own track and a roller furling reacher or Code 0, which tack down to the bowsprit, are options. 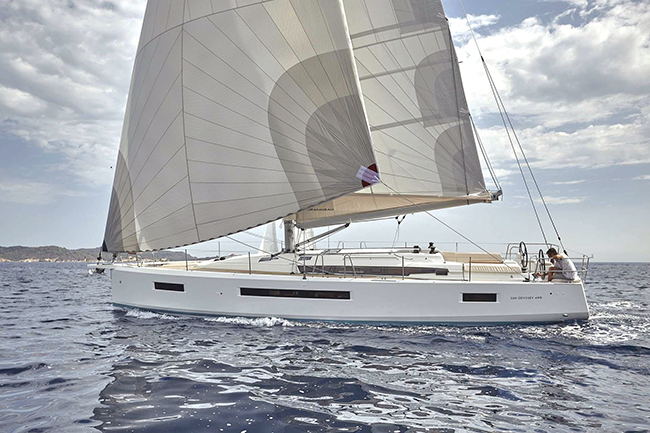 The foredeck is huge and has plenty of room for handling a spinnaker or stowing a dinghy while sailing on an offshore passage. The forward locker is large enough for spare sails, fenders, docking lines and other inflatable water toys like a kayak or SUP. 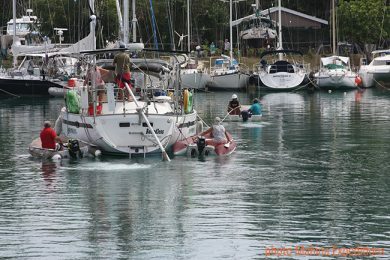 The anchoring system is set up for a single hooking type anchor on a roller under the bowsprit, an all-chain rode and a large electric windlass. A windlass control head can be mounted back at the helm as an option. The optional bow thruster is of the lowering type and will be mounted inside the forward gear locker, thereby reducing the storage space. But, on a boat of this size, a bow thruster is a real boon for a cruising couple. And, you can add a stern thruster as well, if you have a very tight berth to get in and out of. 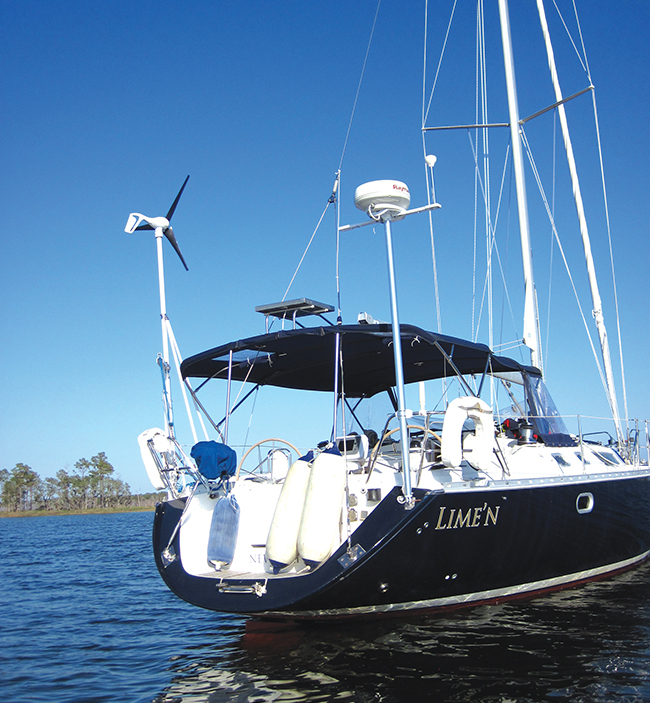 We sailed the boat hard for a couple of hours and came away impressed with the performance built into the hull design and rig, the sure feeling of the twin rudders and helm and the excellent ergonomics in the cockpit for those sailing the boat and those reclining in the sun. Down below the 490’s cabins are all filled with natural light from the side windows in the hull and the large overhead windows and deck hatches. The use of light veneers and white overheads adds to the sense of brightness, which in turn seems to make the already large interior even more spacious. 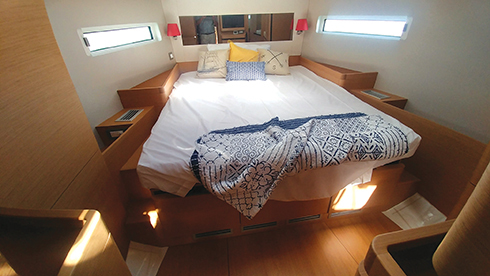 The boat has four interior layout plans to choose from. For a couple cruising on their own, there is a two-cabin version with the master suite forward and a generous after quarter cabin and head. This version leaves the port quarter space open for storage, sails, a workbench and extra equipment. For a family, the three-cabin, two-head version probably is the best choice so that kids or guests will have nice private cabins aft. 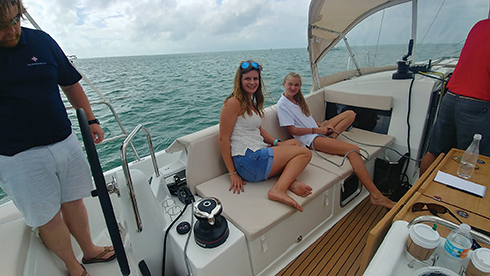 If you have a large family or plan to use the boat in charter, you can swap out the master cabin forward for two smaller cabins and you can add two heads so you end up with a four-cabin, four-head layout. And if you are planning expeditions with lots of crew, you can take the four-cabin layout and add a fifth cabin where the after port head was. This leaves you with a five-cabin, three head configuration. The saloon has the dinette to starboard amidships with the U-shaped galley right across from it to port. The dinette will seat six comfortably and probably eight in a pinch. 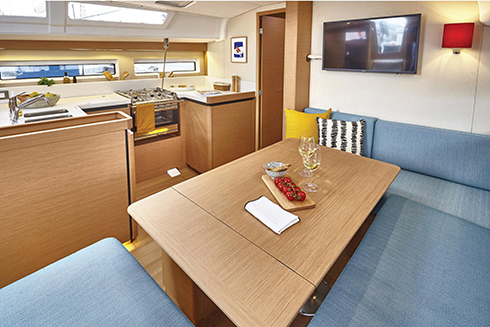 The galley has loads of storage and plenty of counter space for preparing and serving meals. A two-burner stove and oven come standard but it makes sense to upgrade to the three-burner, oven option. The microwave option fits neatly under the galley counter and rises on a mechanical lift to counter level when you want to use it; otherwise it is out of sight. When you are sitting at the dinette table, you can look directly through the side windows at the world around you. This indoor-outdoor feel really adds to the ambience of the interior. The boat we sailed had the chart table option, which we like since we need a place aboard that can double as a navigation and communications center and a home office. The table was big enough for a folded paper chart or ChartKit. 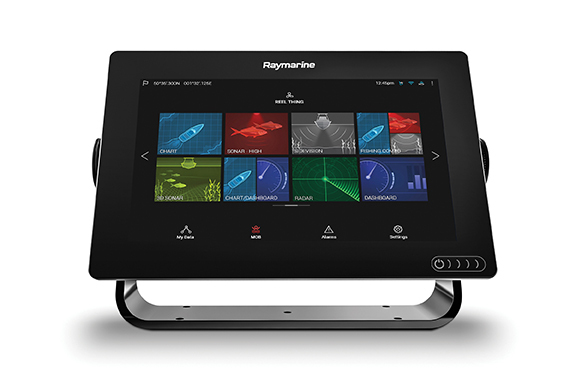 There are good locker spaces for mounting a sat phone, HF radio and a modem but not really a good flat surface for mounting a below-decks MFD or chartplotter; but, with the chartplotter already in the cockpit, fewer owners are opting to have a below decks repeater. 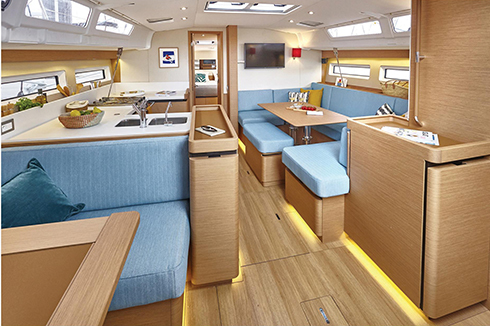 Jeanneau has gone to solid panel floors instead of teak and holly or parquet. This looks clean and neat and allows you to access the large sub-floor storage areas and systems. 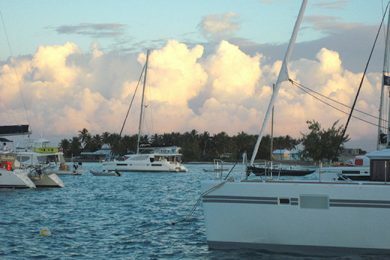 The engine is right behind the companionway steps and has great access from the front and both sides so you can undertake routine maintenance quite easily. The engine compartment is well insulated and we noted how quiet it was when we were motoring in and out of the yacht club. 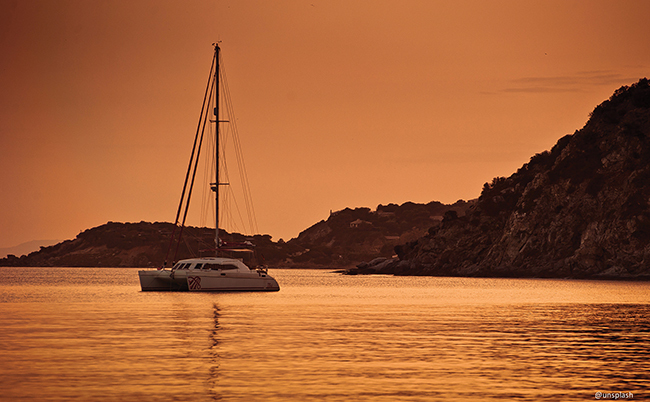 The Sun Odyssey 490 is a big 49-footer with lots of innovations on deck and down below. It sails well, is well thought out, has a great cockpit and very comfortable accommodations below. 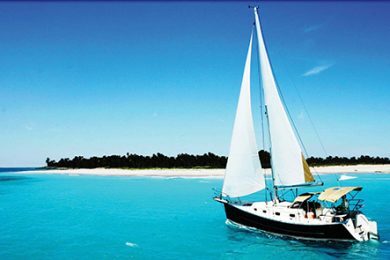 A couple, a family or larger groups will have a great time cruising aboard and have the capability of sailing anywhere their heart’s desire. 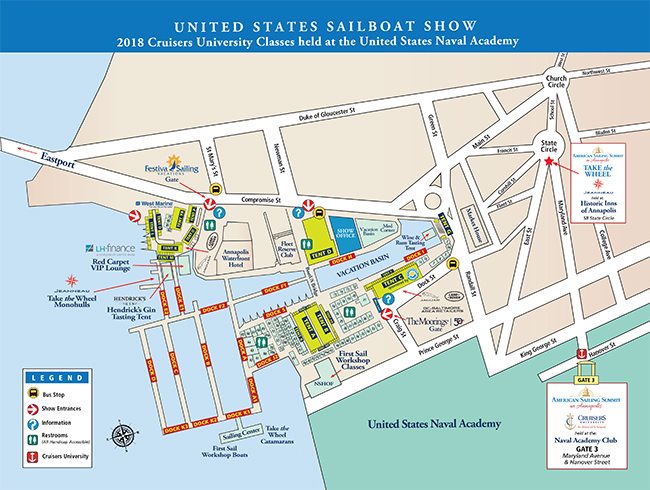 Sail area 1,186 sq. ft.